Over the last few years, I’ve had many vegetarian clients who wanted to transition from being vegetarian to vegan but found it difficult to cut out one particular food: eggs. What actually do you replace eggs with? Yes, there are egg replacement products available but they are highly processed and not particularly good for you. For those who like to eat lots of natural, whole foods, these faux egg foods are a chemical assault on the palate, tasting exactly like the poor-quality ingredients that make them up. However, without them, so many delicious concoctions like pancakes, cakes, macaroons, custard, mousse and meringues are off the table. What’s a vegan to do?! In recent times, recipes that used vegan egg replacements have used flax seeds and chia seeds to create an egg-like texture. I’ve never been a fan of these because, one, half the time they don’t work and two, they add a particular earthy taste to the food. Is there another option? There sure is and, if you haven’t already heard of it, it’s going to blow your mind or better blow your socks off! 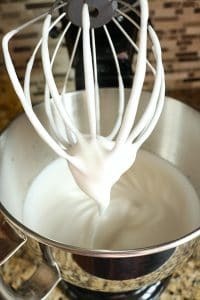 Aquafaba – what is that? It’s the liquid from a tin of chickpeas. Yup, the stuff you usually tip down the sink. The name Aquafaba itself translates as water-bean. Any tin of plain, unsalted, beans will do but most people use chickpeas. What the heck do you do with it? You whisk it up – and that’s it! I have no idea what the chemistry behind this is but when you whip up chickpea water, a scientific reaction takes place and it behaves exactly like eggs. Within minutes you have a bowl of thick, frothy, airy white fluff that is completely indistinguishable by sight to whisked egg whites. Does it replace eggs in every recipe? I personally have only used Aquafaba in sweet dishes but it will likely work in savoury dishes like fritters and crepes too. It works in recipes that require whole eggs, not just egg whites, and the resulting taste and texture is almost always the same as their egg-containing counterparts. I’ve also found it to make vegan baking easy peasy. Milk and butter are already easily replaced with nut milks and coconut oil; now the eggs don’t have to be an issue either. I’m convinced. How do I make it? Water from 1 tin of chickpeas. Use 3 tablespoons of Aquafaba in place of 1 whole egg. Use 2 tablespoons of Aquafaba in place of 1 egg white. Check out our vegan Meringue recipe to see how aquafaba is used to create delicious desserts or maybe try it out in your next batch of protein pancakes! We’d love to see what you come up with! Why not take a picture and tag us on your next instagram post with #vitamin_buddy!